Our newest event has arrived, and for the first time it's a event with more than tech! 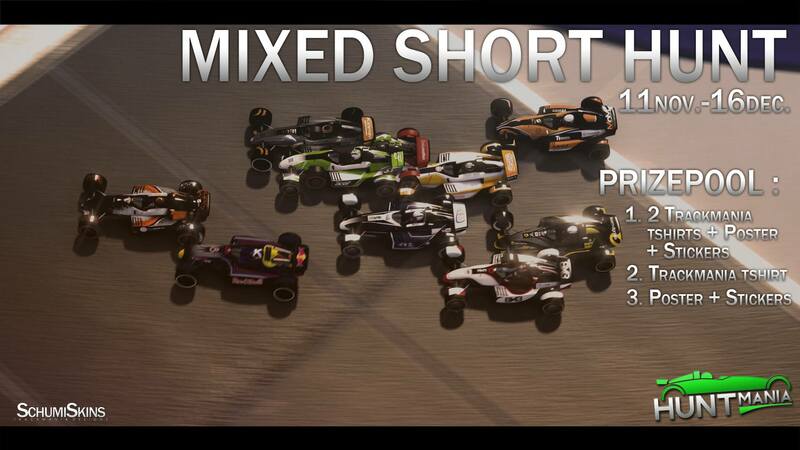 In this event you will see short tech, short dirt, short fullspeed and mini RPG/LOL/Fun. So this will be an event where we will see who is the best hunter in all styles combined. The event will have 4 styles, and last for 5 weeks. Your 4 best scores in each of those 4 styles will count in the total score. So you can have one week off, or your event won't be ruined if you don't like a map. More info about the event itself will follow when we publish the official post about the event. This post is mainly about the map request. All maps must be built and validated in TM2 Stadium. You can build one map in each style. You've use the official sign pack in your maps. Download it from our Downloads page. Where do I send in maps? Remember to not release your map anywhere public until you get a message that it's okey. If there are any questions about the map request, or the event itself make sure to ask us! We'll answer within 24 hours.